There’s a free ‘if-found-please-return-to’ app in Apple’s app store that creates an image you’re supposed to set as your default wallpaper. It’s called If Found and was one of the first things I downloaded when the app store opened for business. It struck me as a great idea, but the simplicity of the thing got me thinking that a) I could have done this myself with Photoshop and a little trial and error and b) I could have made something a lot nicer. So I did and you can too even if you have an older device and don’t feel like shelling out the $10 for the 2.0 software update. Open a blank 320×480 image in your favourite image editor (Photoshop, MSPaint, Pixelmator, Gimp, etc.) Add a background of your choice. I chose one from Social Wallpapering and played with it a little to get it just the way I wanted it. Starting about 120 pixels down, type your message. Include contact details like phone number and email address and a reward amount, if you’d like to offer one and any other message you’d like. Don’t go below the 370 pixel mark. Save your image as a .jpg and sync it to your iPod Touch/iPhone. Now, on your iPhone/iPod Touch tap Settings, then General and then Wallpaper. Find and tap on the image you just created and then tap Set Wallpaper. That’s it. Now whenever you’re on the Slide to Unlock screen (and your device is not connected to the computer) your If Found message will be shown, increasing your chances it’ll be returned in case you leave it in a coffee shop or on the bus. Unfortunately, you can’t take a screenshot of the Slide to Unlock screen, so here’s the next best thing. 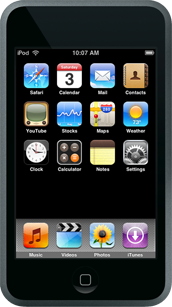 Explore more about: iPod Touch, Wallpaper. Thats my idea that i thought of in 2011 when the first iPhone came out. I am curious, do you know Biagio Vuolo,? Cause he signed a non disclosure of my app/idea in 2011. And BTW there is more to what you proposed here in my find your phone R____D app. But iam thought hiring app makes and friends who steel my ideas!!! Fess up Jason, what gives? Awesome, thanks for the tip! Just set up my "if found" screen. Jason Mayoff is a dad, a tech geek and a Canadian radio broadcaster.